You know that the Biker’s Den has always striven to bring you access to the best gear out there – we put it all under one roof so that you can check out, test out, and buy the right gear for you. Right then. Timing is everything. In life, in engines, and in love. We talked about this a few weeks ago. You guys might have noticed that it’s getting a little cooler on your rides, and maybe you’ve taken the bike out to look at some leaves and some panoramic vistas and felt that chill as the sun sets behind the mountain. Maybe you noticed that after a few years of sun, sweat, and rain, your leather is a little “gamy”. And maybe it’s time to commit to great leather – like Hillside USA and their Horsehide collection. This is leather that’s really tougher than leather – horsehide has been recognized for centuries for how well it wears and how it is one of the few types of leather that is naturally waterproof. 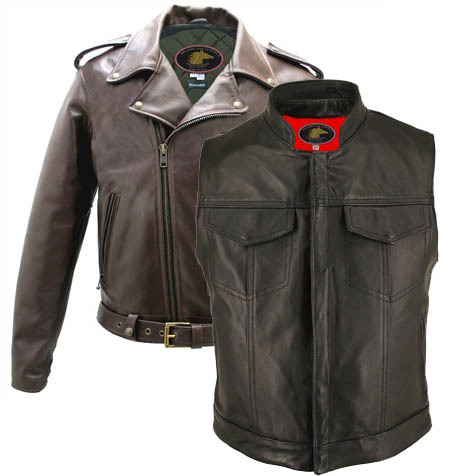 This is top-shelf material, and Biker’s Den is proud to feature it… check out our selection of Horsehide Motorcycle Gear to see for yourself. Of course, the best part is that all Hillside USA’s gear carries a full warranty for as long as you own it. Simply the best!